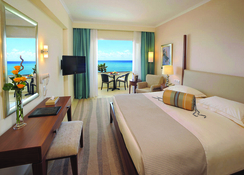 The luxury Alexander the Great Beach Hotel offers guests the chance to soak in Paphos whilst providing premium accommodation from which to explore the region. The hotel itself contains numerous restaurants serving exceptional food and drink with live-cooking and theme nights throw in and cuisine from around the world as well as authentic local Greek and Cypriot dishes. Leisure activities range from the all-day entertainment programme which caters to all ages. Its beachfront location puts it within easy reach of the private beach where guests can simply rest and relax under the golden rays of the Cyprus sun or try their hand at one of the water sports on offer. Popular tourist sites such as the historic Tombs of the Kings and Paphos Archaeological Park will transport visitors back in time. The two nearby waterparks make for the perfect places to combine cooling off with exhilarating fun. Excellent retail shopping can be had at Kings Avenue Mall whilst a superb selection of restaurants catering to tastes around the world are within easy walking distance. The beautiful coastal location of Alexander the Great Beach Hotel finds is located right on the beachfront, providing instant access to the warm golden sand of Vrisoudia II Beach. Paphos International Airport is just 9km from the hotel, making it just a short car journey away. It’s location along Poseidonos Avenue means its ideally positioned to access many top restaurants, Paphos Waterpark, Paphos Luna Park, historic sites such as Paphos Archaeological Park and the Catacombs, retail shopping at local shops and the Kings Avenue Mall as well as food shopping and conveniences such as cash points all within less than a three mile radius. The main restaurant, Roxane Restaurant offers an exceptional dining experience with an extensive dinnertime buffet and show-cooking in the evenings. Garibaldi is the hotel’s exclusive Italian restaurant whilst Seven Orchids brings guests a culinary journey around the tastes of Asia with a stunning al fresco setting enabling guests to dine whilst overlooking the Mediterranean Sea in the summer months (May to October). 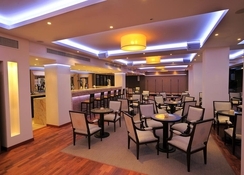 In addition, there’s an on-site taverna serving authentic Greek and Cypriot dishes, an indoor and poolside bar and a café. With so much on offer you may find you don’t need to dine away from the hotel but if you do, you’ll find Indian, Japanese, fine seafood and a whole lot more. Whether you’re travelling as a family, group of friends, on your own or as a couple, there’s something to keep everyone entertained at Alexander the Great Beach Hotel. The state-of-the-art infinity pool is unlike any other you will have experienced with its waterfalls, whirlpools and high-pressure jets which you can enjoy whilst looking out over the Mediterranean Sea. You’ll also find two other pools and a pool just for children. 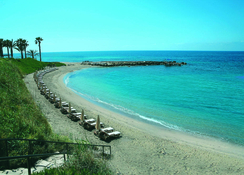 The nearby private beach runs along the coast as fine golden sands meet the crystal clear and warm sea. Various water sports and scuba diving are also available at an extra charge. The hotel is also home to a health club and spa and puts on daily daytime and evening entertainment programmes. There’s much to explore out in Paphos itself with historic sites, water parks, museums and nightclubs. I recently travelled to the hotel with my children. The major selling point, apart from the amazing food and fantastic facilities, was the staff. They were so friendly and so welcoming and relocated for our needs. We loved the Italian restaurant – which was five star and the hotel is close proximity to the town. We will definitely be going back again!